I am not afraid to deny the fact that, I am such a lazy girl! I love being prepped, primed, and finished – shaven, tanned, nails painted – but it’s all so much effort, and so much money! I absolutely adore having smooth legs though – there is literally nothing better in the world than climbing into bed after you’ve just shaved your legs, curling up and going to sleep! I told you, I am quite literally the definition of a lazy girl.. In the past few months, there has been so much talk about the shaving-revolution that is, Friction Free Shaving..
To give you the low down, Friction Free Shaving is a subscription box that delivers a shaver and blades to your door on a monthly basis – or, if like me, you’re lazy enough to not use it that often, a bi-monthly basis – for as little as £5 a month! When I first signed up to FFS, I had been on the look out for a cheap razor on offer in Boots or Superdrug.. The need for a new shaver had been a long time coming, but the thought of spending a huge amount on a shaver and one head always breaks my heart a little! And then, I saw Friction Free Shaving on Twitter..
A girl I follow shared a code that gave 25% off your first order, and I’m a sucker for a discount code.. 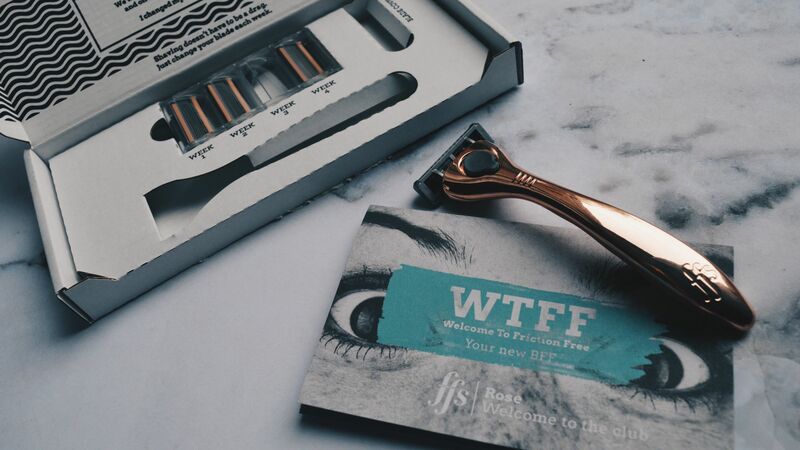 I clicked onto the website, and realised that with that code, my first order could be as little as £3.75 for a razor and four blades – I almost had a heart attack, it was so cheap, but I’d heard such fabulous things?! I ended up opting for Rose – a rose gold shaver, with a bikini blade built-in and a six blade head! I’m an absolute sucker for anything copper or rose gold, and I genuinely believe it was love at first sight.. I ordered it on a Bank Holiday Friday, and it arrived the following Tuesday! I was worried that it wouldn’t fit through my post box, after the website warned that it doesn’t fit through some residential post boxes, but there were no issues at all and it arrived a lot quicker than I had expected.. The shaver itself is weighty – although it feels comfortable to hold – and as described, there were four gorgeous, and super sharp, blades that accompanied it, all packed in a cute little box with a blade cover! I’m super excited for this to become part of my beauty routine, and will do an update on my thoughts after a few weeks of use..
You can get 25% off here, or with the code, 9OE4JW! Have you heard of Friction Free Shaving, or had any experience with them?! The Importance Of A Self Care Routine..
"Keep Winging It – My Three Favourite Eyeliners.."